Last September, Wayne Gretzky, Scotty Bowman, Darryl Sittler and countless other hockey legends assembled in Toronto to see one of the greatest teams ever assembled. Not on the ice, but on the big screen. Gabe Polsky’s Red Army – a feature documentary about the rise and fall of Soviet hockey in the 1970s and 1980s – had its Canadian debut at the 2014 Toronto International Film Festival and now, it’s hitting Canadian cinemas. “That Toronto event was probably one of the greatest moments of my life,” Polsky said of the Toronto premiere that filled the Ryerson Theatre with a who’s-who of hockey stars past and present. Amazingly, these luminaries had all come to see a story in which they were merely the supporting cast. Hockey fans from the 1980s best remember the Soviets from the team's weapon of choice: The Green Unit. The front line of the Soviet attack was a five-man powerhouse that dominated international hockey for a decade, impressed in goodwill barnstorming tours against National Hockey League clubs and stunned a Team Canada which included key pieces of both the Oilers and Islanders dynasties to win the 1981 Canada Cup. The combination featured Sergei Makarov, Igor Larionov and Vladimir Krutov up front with Alexei Kasatonov and Viacheslav Fetisov on the point. These five starred in Polsky’s film, but Fetisov in particular stepped off the blue line and into the spotlight. The mercurial defenceman opened up to provide an inside look behind the Iron Curtain’s most formidable on-ice force. Polsky remembered his trip to Russia to track down the Green Unit alumni and the difficulty in nailing Fetisov into the interview that provided the soul of his film. But what he ended up giving Polsky was rare candor and the details of a system that remains shrouded in mystery. The Soviet national program, handed down from one of Russian hockey’s founding fathers (Anatoli Tarasov) to the divisive personage of Viktor Tikhonov, was outright military. Kept in barracks nearly year-round, the training regimen that led to two Olympic gold medals and six IIHF World Championships between 1980 and 1990 was part training camp and part internment camp. Fetisov recalls Tikhonov refusing teammate Andrei Khomutov leave to visit his dying father and that team officials later threatened Fetisov when the NHL came calling in the late '80s. Polsky used archival footage to get beyond the on-ice story. Yes, there were highlights from the Miracle on Ice and the 1981 Canada Cup triumph, but equal screen time was given to a war-torn post-World War II Russian society and historical footage of strange training routines and exhibitions involving summersaults, gymnastics and bears on skates. The resulting film went beyond the on-ice product to a deeper political discussion that raged between two opposing powers. Polsky sought balance between the sport and the state to a wider Western audience. The Red Army stars had given all they could for their homeland. It was time to take on the world’s best players. Hockey Hall-of-Famer Mike Gartner had more experience playing against Fetisov than nearly anyone before Russians began to flood the NHL. He dealt with his future Hall-of-Fame classmate in three World Championships, Canada Cups the World Junior Championship and even a midget hockey invitational in 1975. Canada had to better equip itself to handle the Soviet onslaught after 1981. Shell-shocked 8-1 in the Canada Cup Final, the Canadians knew they needed to load up to beat the Green Unit. Soon enough, though, the Soviets' best was no longer strictly an international concern. Beginning with the 1989 defection of Alexander Mogilny, the door to the NHL was finally open to the Green Unit. Within one year the Berlin Wall toppled, Communist governments fell in Poland, Romania and Czechoslovakia, and stars began moving westward. But how would they adapt? The move to North America went smoother for some than for others. Makarov debuted with 86 points for the Calgary Flames at 31 years of age and won the 1989-90 Calder Memorial Trophy as Rookie of the Year. He forever stamped his name on the League. The NHL has had “The Makarov Rule” in place ever since, limiting Calder eligibility to players aged 26 and under. Fetisov and Larionov made solid impacts in New Jersey and Vancouver, respectively before separate trades reunited them in Detroit in 1995. Under Bowman, the Red Wings revived the Soviet style – puck possession, precision passing and meticulous patience to create the perfect scoring chance - to establish one of the League’s most formidable power plays. 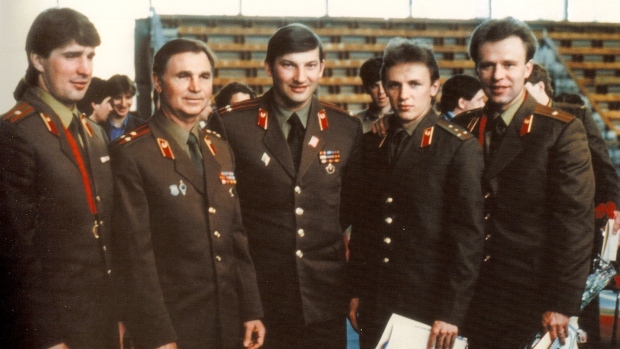 The two Green Unit alumni were complemented by Sergei Fedorov (not pictured), Vyacheslav Kozlov and Vladimir Konstantinov to form the Wings’ “Russian Five” combination in the mid-90s. The experiment was an unmitigated success helping the Wings capture back-to-back Stanley Cups in 1997 and 1998. The five accounted for 10 of the Wings’ 17 power play goals in the 1997 Stanley Cup Playoffs and the forward trio produced a combined 45 points in 20 games. A career-ending accident took Konstantinov out of the line-up for the second Cup, but the team – and his Russian replacement Dmitri Mironov – rallied around the fallen blueliner. Krutov and Kasatonov, meanwhile enjoyed mixed results. Kasatonov lasted seven years in the NHL before injuries derailed his career. Krutov, though, was gone after just one season. He left the Vancouver Canucks after an 11-goal 1989-90 season and finished his playing career in Europe. Krutov’s story was possibly the most tragic of the lot. The IIHF Hall-of-Famer died at 51 years old in 2012, mere months after conducting his Red Army interview. Polsky's time with Krutov was emotional. “He almost embodied the Russian soul, like the sadness of this heartbroken guy, still living in the past and the glory of the past and he couldn’t really make it once he got all this freedom and independence. He didn’t know what to do with it,” Polsky said. After conquering the world and the NHL, one might think Russian hockey could only remain dominant. Polsky’s narrative ended with the Red Wings’ Russian heroes triumphantly bringing the Stanley Cup to Red Square surrounded by the adoring Moscow masses. Internationally, however, the best had arguably already past. Russia won the World Championship in 1993 led by the aforementioned Khomutov and his 12 points in eight games. However, that victory was the beginning of a vacuum. The Russians did not win another World Championship until 2008 when an aging Fedorov teamed with his then-Washington-Capital-teammates, Alexander Ovechkin and Alexander Semin, to win gold in an overtime thriller. Since the foundation of the Kontinental HockeyLeague - Russia's new top division - in 2008-09, the nation has won three of six IIHF World Championships. A true All-Star team, featuring KHL standouts aided by Russian NHLers out of the Stanley Cup chase, has been afforded the Russian team since the KHL season ends prior to the beginning of the Worlds. In recent years, that has included the likes of Ovechkin and Evgeni Malkin. However, a true best-on-best title has eluded them since 1981. The nation may have reached a new low point with the 2014 Olympic Games. Playing on Russian soil and under the constant gaze of President Vladimir Putin, Finland clipped them in the quarter-finals, forcing a Russian exit from the Sochi Games without even a shot at a medal in hockey. Polsky blamed a shift away from the Soviet system. What was lost - in his mind - was a true art form. Red Army opens in select theatres in Toronto and Vancouver on Jan. 30.